"Years later as Swami (Sai Baba) sat one day surrounded by His devotees, there was an abrupt interruption. A pundit, well-versed in the holy Puranas felt a sudden urge to ask a question. "Swami! Was your incarnation a Pravesa (an entrance) or a Prasava (encience)?" I could not quite understand the relevance of the interruption that jolted everybody away from jocular mood of the talk, but Swami knew the reason. Turning to Easwaramma seated in front, He said, "Tell Rama Sarma what happened that day near the well after your mother-in-law had warned you." Mother said, "She had dreamt of Sathya Narayana Deva and He cautioned me that I should not be frightened if something happens to me through the will of God. That morning when I was at the well drawing water, a big ball of blue light came rolling toward me and I fainted and fell. I felt, it glided into me." Swami turned to Rama Sarma with a smile 'There you have the answer. I was not begotten. It was Pravesa, not Prasava." "In olden days, it was a common practice among the women of Bharat (India) to perform the sacred ritual of Sathyanarayana Vratam, on every full moon day. Likewise, mother Easwaramma used to perform Sathyanarayana Vratam every full moon day in the company of Karanam Subbamma, who was her neighbour. Karanam Subbamma would often tell Easwaramma, "You are performing Sathyanarayana Vratam. With His blessings, you will bear a son. I want you to name him Sathyanarayana." On a particular full moon day, Easwaramma did not have food untill very late in the afternoon, since she was participating in the Sathyanarayana Vratam being performed in Subbamma's house. The family members, including her husband Pedda Venkama Raju, were very much upset to see her remain without food for such a long time. Pedda Venkama Raju argued that there was no need to observe such severe austerities. But Easwaramma was determined. She told them not to wait for her saying, "I am not at all hungry. Sathyanarayana Vratam is more important for me than food." After the ritual was completed, Subbamma brought prasadam (blessed food) for Easwaramma. Only after partaking of the prasadam did Easwaramma have her food that day. Women in those days used to perform such rituals with all sincerity and devotion. Only after partaking of prasadam could Easwaramma conceive. Yad Bhavam Tad Bhavati (as is the feeling, so is the result). Some people have faith in scriptural injunctions and adhere to them with earnestness, whereas some others ignore them. 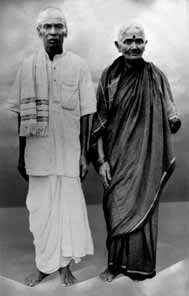 Easwaramma was the one who followed the injunctions strictly. Only after performing the vratam and partaking of the prasadam would she commence her household chores. She was unlettered. But she had unflinching faith in God. During the seventh month of her pregnancy, one day Subbamma told her, "Easwaramma, the child in your womb is safe due only to the grace of Lord Sathyanarayana." She extracted a promise from her that the child would be named Sathyanarayana. 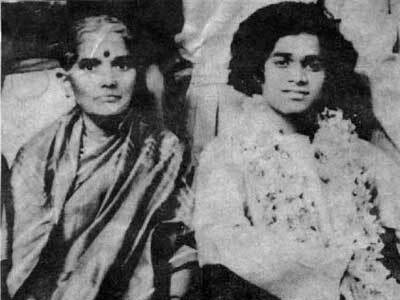 The mother of Pedda Venkama Raju was also a great devotee of the Lord. She too was of the opinion that the child should be named after Lord Sathyanarayana. Prior to the birth of the child, a very significant incident took place. Puttaparthi was then a tiny hamlet. In the centre was a well from which people would draw water. One day Easwaramma was fetching water from the well. All of a sudden, she saw a white luminous light, emerging like lightning from the sky, entering her womb. There was a sudden gust of wind. Subbamma, who came out of her house at that time, saw the light entering the womb of Easwaramma. Till this day, I have not revealed this to anyone. I am disclosing this today so that you may understand the significance associated with the advent of the Avatar. A day prior to this, as Pedda Venkama Raju was passing in front of Subbamma's house, she called him inside and told him, "Venkama Raju, tomorrow when the child is born, name him as Sathyanarayana." But he brushed her advice aside saying, it was her foolish imagination."